Fruit juices are one of the healthiest drink for everyone. Even doctors advise their patients to drink fruit juices every day. Everyone crabs for a glass of juice while walking and gossiping with their friends. Or, when people meet someone for a small conversation, they want to sit somewhere and have a glass of juice. Especially in the summer season, the hot weather makes people want to drink a glass of fresh and cold fruit juice. 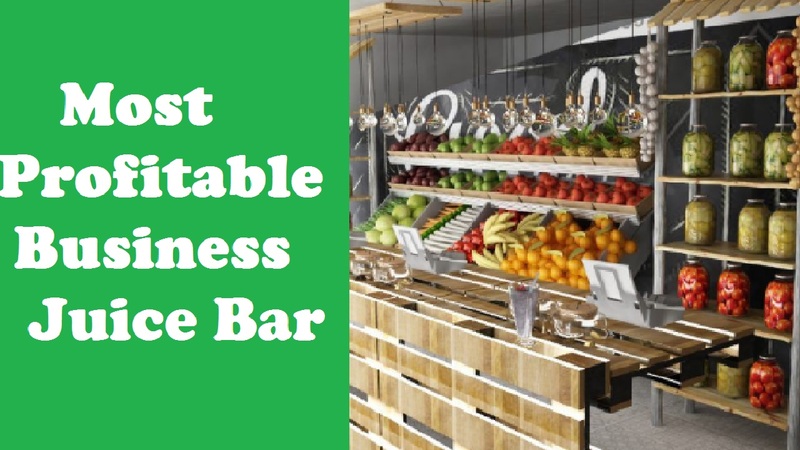 So the idea of starting a juice bar is an absolutely perfect idea. And it is also a very profitable business. If you can provide good services to the customers, it will be super easy for you to earn fame and money. Your budget and expenses totally depend on you. Make an effective business plan for your business. If you have more money, you can invest more money to buy materials and other necessary stuff. However, if you don’t have that much money yet it’s okay. You can still start your business with a small budget. Of course, the size of the business will be small and you will have fewer products but you can increase that later with your profits. So, starting with a small size will not create any problem to your success. Yet if you want to make a grand opening with a larger sized business then you will have to go through some extra steps for borrowing money. Such as, you can either borrow money from your friends or relatives or can take a loan from banks. The different bank provides different types of a loan based on one’s business. And if you are a student, you can get student loans easily with fewer interests. These are the easiest way to get money for your business. After gathering your budgets you can now concentrate on your expenses. And your expenses will be depending on what you want to buy for your business’s benefit. Such as stuff related to making juice and maintaining your business. You will need to pay salaries to your workers. You will need to buy materials for providing service to the customers. You will also have to pay taxes depending on your business properties. All these things are part of your expenses related to your business. Every business has its own necessary items which are only ideal for that business only. Likewise, your business has some of its own necessary items which are compulsory without a second thought. So, now I’m going to tell you about all those items that you will badly need to start your business. The most important things are the juice makers. As you are going to open a juice bar, so, juice makers are a must needing item. Then you will need glasses, straws, and trays for serving juices. These are just basic needs. Tables and chairs are another important things because without them it will make your juice bar look so plain. And your customers will also feel uncomfortable at your place. So make sure you provide them with a comfortable and relaxing atmosphere. You can also keep vending machines for providing the instant juice. That will make your work less difficult as it is a self-serviceable way. A freezer is another item that you will need. Because who doesn’t want an icy cold juice in a hot weather? Everyone does. So, make sure to get one. There are also a lot of additional items that are related to all these items. And you will easily notice them, such as tissues, spoons, cleaners, and so on. Another thing is, as you are opening a juice bar, obviously, there will be various types of juices which will also be of different flavors. And that’s why you will need a few juice makers. And you can also make different design’s glasses matching with you juice’s flavor. You can decorate your juice bar the way you want. Or, can get ideas about decoration and decorate it with the help of experts. Of course, that will increase your expense. So, keep that in mind. If you can manage that under your budget then it’s okay for you. But if not, then it’s okay. You can still get a beautiful decoration. The first and most important thing for decorating a shop is the name-board of the shop. You should pay more attention to that. Choose a suitable name for you juice bar and decorate it with the most artistic way so that it catches the customers’ eyes. You can decorate outside of your shop along with the name-board. Because if it looks good from outside people will wish to come and visit it at least once. As juice bar mainly concerns about customers relaxing and comfort then you will have to concentrate on that. The color of the bar should not be dull and boring. Make it lively and attracting. And, don’t do only one color as it is considered as old-fashioned Try playing mind soothing songs. Lighting also matters in this kinds of business. So, keep an eye on that too. After you complete all these pre-opening activities, you can make the opening of your long cherished juice bar. Even when you are making the opening you have to keep a few things in your mind. Such as forgetting customers impression and for the new opening, you can provide different offers on different products. That will help you with getting customers’ attention. Yeah, that’s pretty much it. Now you are all set for your new juice bar’s opening. My best wishes are with you. Hope you find it helpful and do well with your business.